Hugh Thomson was one of the most popular and successful book illustrators of the Victorian era. He was born in Ireland in 1860, where his skills as an illustrator were recognized when he was still a teenager. Hugh was trained by John Vinycomb, the head designer at Marcus Ward & Co, a prominent Belfast publishing house. 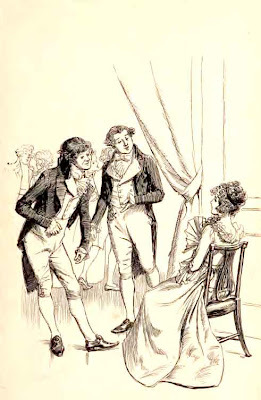 He moved to England, where he worked for MacMillan & Co. from 1883 and on, illustrating all six of Jane Austen’s novels and other literary classics. By 1900 he had become one of the most popular illustrators of his time. He died in 1920. And great work, this blog! Thanks for producing an informative blog. I’ve just returned from a visit to BATH. Walking the paths JA had trodden and beholding the sights she had seen have heightened my appreciation for her works, without having to resort to imagination, however potent it can be. I’ve some fresh pictures from my travel posted under Jane Austen’s Bath in my Blog, you’re most welcome to visit. Thank you, I also enjoy the illustrations in Dickens novels. Good morning my name is Justin, and i live in Sydney. I have a novel from Pride and Prejudice which i found in a book store. ( To J COMYNS CARR In Acknowledgement of all i owe to his friendship and advice,these illustrations are greatfully inscribed, HUGH THOMSON). I was wondering if it may be worth something. If you do, I would be keen on having a look at it, and if it is in good condition (and we agree on a price) buying it. Justin – did you ever sell the book, and if you did, do you mind telling me for how much? I have the SAME book, same date, and SAME exact inscription! I have one too, bought in the UK more than 20 years ago, and given to me as a present, thought to be an early copy. It is now with me in Canada. Blue, black cover, rough cut pages, peacock with 1894 in feathers on Title page with tissue protection page. 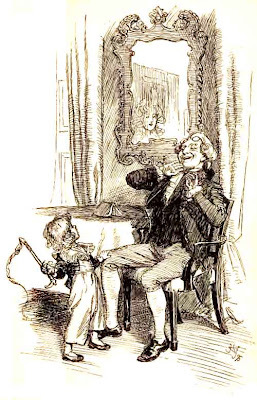 whose illustrations of coaches,hunting scenes, humorous incidents closely resembled Caldecott’s . However, of course Hugh soon developed his own, very delightful style. I collect books mainly, on or about, illustrators but if I buy any more books my book-cases will collapse. I would treasure it if I were you or find whether there is a Hugh Thomson Society who most definitely would appreciate it. Did you manage to sell book,if you did could you give me value of book as I have one similar.Would appreciate.